Where in the world was this book when I was still in an elementary setting? Oh my word! The sheer amount of times I have heard in my career that our littlest learners can’t do something… it’s innumerable! Sad truth is, we aren’t giving them an opportunity to show us that they can do so many of the things our older students are doing. As a teacher, I will be recommending book 38 to every PreK-2nd grade teacher I come in contact with; as a parent, I will be using so many of these ideas for my own 5 year old! I actually just bought an additional copy to gift to her kindergarten teacher (shhhh)! I’ve been trying to do #DBC50Summer in order of release date, and we are entering a period of Dave Burgess Consulting, Inc where books are released back-to-back-to-back! It’s interesting to note that Teach Like A Pirate was released in 2012 and the second book, Pure Genius wasn’t released until 2014. Beginning in 2015 and continuing through Summer of 2016, DBC was releasing a book a month on average. Then in 2017, DBC, Inc really started to take off, releasing twelve books in just over 8 months and 2 more to round out the calendar year. This year Dave and Shelley have published 22 books between January and the end of July! We were treated to three and four books a month this summer! It seemed like each week another one was coming out! Because of that, the remaining books in #DBC50Summer were typically released within days of one another and I’ve done all I can to be sure the book numbers are correct. I reached out to DBC when I first began this process. Using the information from DBC, I did some research using author blogs, tweets, and sending direct messages to the authors asking if they remembered the official release date of their book(s). (I’m a fan of triangulating data… I blame my MLS classes, ha!) Definitively, book 39 (more on that in a minute) was released on February 19, 2018. 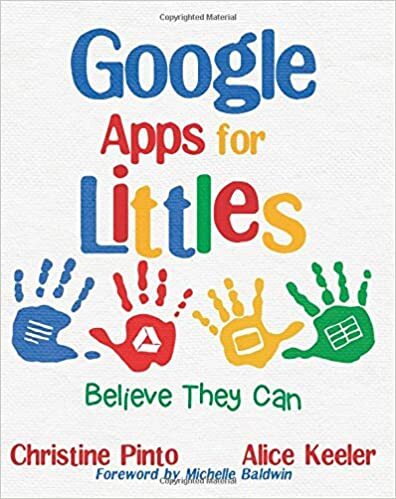 Checking blogs and tweets, Google Apps for Littles by Christine Pinto and Alice Keeler was already out and doing amazing things on the Amazon best new release list, which would make it book 38! Like all other books from DBC, Inc that have Alice Keeler’s name on the cover, this book is extraordinary! Each of the books about the Google line are in full color and are absolutely stunning! Check out this page from one of the #BookSnaps I tweeted today. Isn’t it gorgeous? I love that Christine Pinto put pictures of her students and shared their work in this book! Seeing the excitement on their faces and photos of her organization really brought the book to life! The handprints with Google logos on the front of the book are a perfect addition and definitely make the cover memorable! From the very beginning, I was captivated by this book! Even the foreword (written by Michelle Baldwin) was incredible! I have been guilty of logging into computers for my littlest students and then having them just leave the lab while I would run around and log every student off after they left. I love the authors’ idea of making a challenge for students to log on and off the Chromebook or Google Chrome account, putting a sticker on an incentive chart for each time it is done correctly. I’m telling you what’s the truth… there’s not a whole lot that the Littles (probably just go ahead and read that as middle schoolers, too) wouldn’t do for a sticker. Bonus cred if you get the smelly stickers. I’m just going to go ahead and say that smelly stickers saved my classroom management plan on multiple occasions. I especially love the “Meaningful Tech Integration” section of the Introduction in which Christine and Alice point out, “Replacing those activities [manipulatives, blocks, toys, etc] with computer tasks does not make learning better.” They go on to point out that allowing students, even the Littles, to use technology gives them an opportunity to learn, practice, collaborate, share, and connect. The authors do an amazing job sharing the logistics of using Chromebooks, iPads (or other tablet), and/or Google Chrome on desktops in the PreK-2nd grade classroom. I love the log-in cards and color coding the keyboard and log-in cards to assist students in finding the letters and numbers to match. One of the key themes in this book is having our students learn by exploration. Alice and Christine encourage us to allow students to click and explore as they learn about icons. As is true with many DBC books, there are links to template after template that allows you to take this back to your classroom tomorrow! I love the pixel art and appreciate the link in the book! My students love to create pixel art in Minecraft, but we only have 8 computers in our Minecraft Lab, so using Google Sheets with conditional formatting is an excellent way to incorporate this art form in class! I can totally see using this as a BreakoutEDU clue in the near future! Searching for images with word families is definitely an activity I will do multiple times with Sophie, my daughter who just started kindergarten. She would love finding her own images on the internet. And the “explore” feature creating the best layout on the slide is just plain genius! I will definitely be using the color coded slides to assign slides to groups from this point forward! What a simple way to visually assign slides! There are so many things I can implement, even though I don’t teach the Littles anymore! Just as Teaching Math with Google Apps had a math focus, but could be used by any teacher because the information contained was just that good, Google Apps for Littles is focused on our youngest students, but certainly has relatable information for teachers of all grade levels! Don’t be fooled by those cute little handprints on the cover! Even if you’re a high school teacher, you will want get something out of this one! I am the faculty sponsor for multiple clubs at my school. Makerspace Managers (which will also function as Innovation Engineers, thanks to Pure Genius by Don Wettrick), Game Club, Between the Lines Book Club, and now I will have students coming to the media center for an open invitation genius hour opportunity. I’ve been trying to figure out a way to manage that time without grading and formalizing the process. I want the students to want to be there and not feel as if it’s another assignment being dumped on them. The Template Tab information from this book is exactly what i was looking for! Using this template, each student will have their own tab in one Google spreadsheet and they can reflect on their progress, communicate with me about wants and needs, and have a running journal of their genius hour journey to use if they choose to blog their story on the school’s new student-led blog (which is the implementation plan for Shift This by Joy Kirr and Ditch that Homework by Matt Miller and Alice Keeler.) I love when multiple implementation plans come together because it is making #DBC50Summer more cohesive and intentional. It’s also helping me think through the actual implementation and what will and may not work. I also loved Kasey Bell‘s Magnetic Poetry Template! You can find more about magnetic poetry on Kasey’s blog at shakeuplearning.com/magneticpoetry (you’ll hear more about her very soon)! I look forward to sharing that with my middle school students next week, just as a fun activity. Then they can screenshot it using Alice’s extension and add it to a school-wide collaborative Google Slides. Now that revision history has been improved, I’m not as worried about a student deleting slides or adding anything inappropriate. There are so many additional ideas for encouraging our Littles and providing them the same opportunities as our older students that can be found on Twitter! You can find these using the hashtag #GAfE4Littles! Christine has a beautiful website that can be found here. I would definitely recommend checking out the #InnovatingPlay and #SlowFlipChat sections of her site! (May also want to create a column in your Tweetdeck for those as well!) Remember the rabbit hole that is Alice’s website? It can be found here. The Google Teacher Tribe podcast (Kasey Bell and Matt Miller) interviewed Christine! You can listen to that here! Vicki (@coolcatteacher) Davis also hosted Christine on her 10-Minute Teacher podcast here. I would also highly recommend subscribing to both Christine’s and Alice’s YouTube channels! If you’ve been following this journey for any length of time, you likely know what comes next. The flipgrid is available, thanks to the brilliant idea of my friend, Andrea Paulakovich! She kindly asked me if I’d like to co-pilot this global collaborative space available for all DBC books; of course I said yes! Please feel free to share your thoughts there and bring some friends along! I am so excited to get to read book 39! It’s by two principals from my home state of North Carolina! In fact, they are located about an hour from my school! (Quick story) When I met Dave Burgess in April, we had a discussion about this book. In fact, it was through this conversation that I knew he (and his company) was legit. I mean, I had my doubts… I wondered if it was all a show. (I can be fairly cynical – we’ve covered this in another blog. I’m working on it.) You see, he brings a selection of books to his speaking engagements that he sells at a discounted price and will sign and personalize Teach Like A Pirate and/or P is for Pirate for you. What got me was that he could tell anyone who approached his table about each of the books he had published (not only the ones that he brought with him). He knew all 65 authors by name, and knew where they were from. The company is growing exponentially, but somehow he and Shelley have still managed to make it feel like a family. Book 39 caught my eye because of its beautiful cover; he let me know that the authors were from North Carolina and shared a story about the book with me. I knew then that I had to get it! So one of the five books I bought that day was The Limitless School by Abe Hege and Adam Dovico. I am pumped to finally be able to read book 39 after owning it for nearly 5 months! Hoping to blog about it tomorrow! Only twelve books left and 15 days until Fall begins! I can totally do this! WOOOOT! A student-led blog!! That’s such an empowering shift, Alicia! Thanks for sharing the plan! Make sure to tweet out the posts so we can all visit and leave comments! Yippee!! Oh I am so pumped!!! I get to unveil this to students next week! It’s going to be awesome!! !